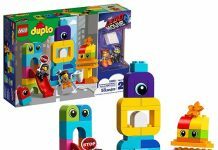 First introduced fifty years ago, DUPLO bricks were designed for the younger audience of LEGO customers. Twice as big as the normal bricks, DUPLO was big enough to reduce the risks of being swallowed by small children. Since they used the same style, DUPLO were compatible with normal bricks. Sold at first with the regular LEGO sets, it became its own brand in 1975. Aside from a few years off the market, DUPLO has carried on ever since. By the 80s, it even had its own versions of minifigures, but bigger and unable to be taken apart. Toddlers remain delighted by DUPLO to this day. Fun Fact: LEGO Duplo appears in the LEGO Movies and is one of the key antagonists in The LEGO Movie 2. General Sweet Mayhem, the leader of the Duplo army from planet Duplo, frequently invades Apocalypseburg.